I am very pleased to note that an my article on the impact of social media and especially of blogs and Twitter on peer review in chemistry in particular and science in general has just come out in a special issue of the journal 'Accountability in Research'. This project has been in the works for almost a year and I have spent quite a bit of time on it. The whole issue is open access and it was made possible by the dedicated and generous efforts of my colleague and friend, the eminent historian of chemistry Jeff Seeman. I am privileged to have my article appear along with those by Roald Hoffmann, William Schulz, Jeffrey Kovac and Sandra Titus. All their papers are highly readable. Here in a nutshell is what I say. I have had a very dim view of Twitter recently as a vehicle for cogent science communication and rational debate, but in this article I find myself full of praise for the medium. This sentiment has been inspired by the use of Twitter in recent times for demolishing careless science and questioning shoddy or controversial papers in the scientific literature. 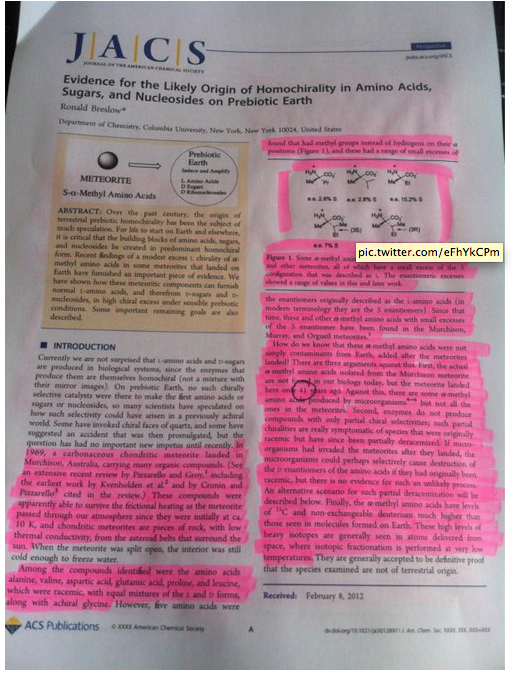 In my opinion the most spectacular use of Twitter to this effect was Nature Chemistry editor Stuart Cantrill's stark highlighting of 'self-plagiarism' in a review article published by Ronald Breslow in JACS in 2012 (I hold forth on the concept of self-plagiarism itself in the article). As I say in my piece, to my knowledge this is the first and only instance I know in which Twitter - and Twitter alone - was used to point our errors in a paper published in a major journal. If Cantrill's analysis was not a resounding example of peer review in the age of social media, I don't know what is. I have had a much more consistent and positive views of blogs as tools for instant and comprehensive peer review, and thanks to the vibrant chemistry blogosphere that I have been lucky to be a part of for almost eleven years, have witnessed the true coming of age of this medium. There is no doubt that peer review on blogs is here to stay, and in my article I address the pitfalls and promises inherent in this development. One of the most important concerns that a naive observer would have regarding the use of blogs or Twitter for peer review is the potential for public shaming and ad hominem attacks - and such an observer would find plenty of recent evidence in the general Twittersphere to support their suspicions. Yet I argue that, at least as far as the limited milieu of chemistry blogs is concerned, the signal to noise ratio has been very high and the debate remarkably forward-thinking and positive; in fact I think that, by and large, chemistry blogs could serve as models of civil and productive debate for blogs on more socially or politically contentious topics like evolution and climate change. I am proud to be part of this (largely) civil community. What I aim to do in this piece is to view the positive role of Twitter and blogs in effecting rapid and comprehensive peer review through the lens of three major case studies which would be familiar to informed observers: the debacle of 'arsenic life', the fiasco of hexacyclinol and the curious case of self-plagiarism in the Breslow 'space dinosaurs' review. In each case I point out how blogs and Twitter were responsible for pointing out mistakes and issues with the relevant material far faster than official review ever could and how they circumvented problems with traditional peer review, some obvious and some more structural. The latter part of the review raises questions about the problems and possibilities inherent in the effective use of these tools, and I muse a bit about how the process could be made fairer and simpler. Due to the sheer speed with which blogs and social media can turn our collective microscopes on the scientific literature and the sheer diversity of views which can be instantly brought to bear on a contentious topic, there is no doubt in my mind that this new tier of scientific appraisal is here to stay. In my opinion the future of completely open peer review is bright and beckons. How it can complement existing modalities of 'official' peer review is an open question. While I raise this question and offer some of my own thoughts I claim to provide no definitive answers. Those answers can only be provided by our community. Which brings me to the crux of the article: although my name is printed on the first page of the piece it really is of, by and for the community. Hope there will be something of interest to everyone in it. I welcome your comments.